Found eggs on Monday, figured out they were io moth eggs. Looked up io caterpillars, and I had seen one a few weeks ago! 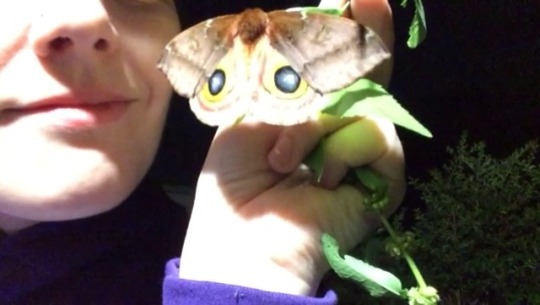 Just today I was lamenting how all these io moths are coming to my yard but I never get to meet them. Well. I needed to get some fresh food for the stinkbabies. Went out on what would have been a quick trip out back, but I found a tiny baby giant stick insect and really wanted one I could (1) fit under the microscope (2) raise through a few molts to document physiology changes (3) have a fun developmental stages visual at the sanctuary on Saturday. I cut the stem the stick insect was on, walked straight over to the stinkbabys’ favorite food. The bush they like is by the mountain laurel. The mountain laurel had an enormous moth on it. I knew INSTANTLY what moth it was, even only seeing the underside. So, I had my mini-freakout, trimmed some stalks for the stinkbabies, fiddled around to keep the baby stick from falling off, and trimmed the branch the io moth was hanging off. Carried the moth and stick insect to the porch with better lighting. Got lots of closed wing shots, then I poked it (I lift up the outer wing on sphinx moths to ID them more easily, tried this on the io too). Apparently poking ios results in some… Defensive behavior. This was too fun to not to video record, so I waited for the wings to close, then recorded the video. Problem is, hands were full of bugs and phone. So I made due. Io got fed up and left after I’d been poking for a while. But oh man. This was the best. I have officially seen three life stages (larva, eggs, adult). Now I’m just missing the cocoon. Flashback to my first adult io moth. A beautiful lady! !